The Drexel University women’s basketball team won a pair of home Colonial Athletic Association matches, blowing out the College of Charleston Cougars 76-53, Jan. 25, and defeating the University of North Carolina Wilmington Seahawks Jan. 27, 67-55, during which junior Bailey Greenberg posted a career-high 31 points. The Dragons led from wire to wire in both matches and have now won five straight. Against the Cougars, Drexel established control of the game quickly. Junior Aubree Brown hit a three from the top of the key, and freshman Maura Hendrixson added two other triples to make it 17-6 Dragons. Drexel forced nine turnovers in the second quarter to take a larger lead. The Dragons capitalized on the Cougars’ mistakes with success from range, drilling four threes in the quarter. Sophomore guard Hannah Nihill got the first three to go down, followed by one from Brown and capped off by another pair from Hendrixson. The buckets pushed the Drexel lead to 34-16. The Charleston offense fared better in the second half but was never able to get back in striking distance. A layup by redshirt freshman Ericka Broughton cut the Drexel lead to 19, but the Dragons offense was able to keep pace. Greenberg was the main force for the Dragons’ offense, posting 14 points in the half. Additional threes from Nihill and Hendrixson, along with six points from sophomore forward Mariah Leonard, put Drexel up for good. The three ball was a consistent strength for the Dragons in the game, shooting 9-18 (50 percent) from beyond the arc on the day. Charleston, on the other hand, was held to a measly 2-18 (11.1 percent) from deep. Four Dragons scored at least 10 points in the contest, with Greenberg having a game-leading 18 points. Hendrixson posted 15 points for the Dragons while shooting 5-6 from three-point range. Hendrixson was honored by the conference for her performance, picking up her second Rookie of the Week this season. For the Cougars, senior Darien Huff and Broughton each had 12 points. Drexel shot well on the day, going 28-52 (53.8 percent) on the day, while Charleston was held to 18-51 (35.3 percent) shooting. At the Daskalakis Athletic Center against the UNCW Seahawks, the Dragons, led by Greenberg, came out firing. Greenberg scored five points in the first four minutes of the game to put the Dragons ahead. Then a three from freshman Keishana Washington put the Dragons ahead 10-3. 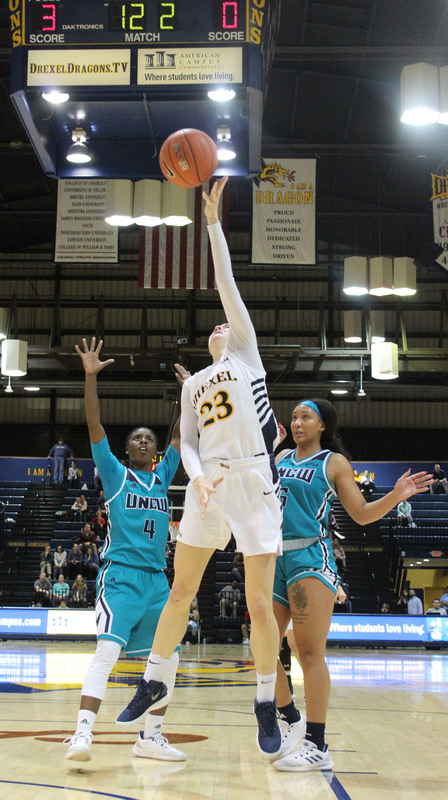 Later in the quarter, UNCW responded with free throws from senior Chinyere Bell and junior Timber Tate, but a three from Hendrixson gave Drexel a 22-12 advantage. In the second quarter, Drexel played strong defense to get a stronger grip on the game. The Dragons’ top-ranked defense in the country allowed only two UNCW baskets in the quarter, a contested layup by redshirt junior Gigi Smith and a jumper by sophomore Carol-Anne Obusek. Over the past seven games, Drexel has surrendered an average of only 6.1 points in the second quarter. The stout defense combined with eight points from Greenberg, and threes from Nihill and Hendrixson, gave Drexel a 38-16 lead going into the break. Out of halftime, UNCW went on a 6-0 run, highlighted by two fastbreak scores from Lacey Suggs. Drexel responded with buckets by junior Niki Metzel, Greenberg and another three from Hendrixson pushed the lead back to 21. However, the Seahawks would go on another run near the end of the third to keep the game close. The 11-0 run stretched into the fourth quarter, cut the deficit to nine and was highlighted by six points from Smith. A three-pointer and second-chance layup from Ashli Jeune made it 52-46 Drexel with half the fourth to go. Drexel responded by going on a 7-1 run to close out the game. Metzel hit a jumper, followed by Greenberg’s 13th basket and a three from Hendrixson. The run gave the Dragons a 12 point lead which would last until the final buzzer. A total of 31 points from Greenberg is the most scored by a Dragon since Sarah Curran scored the same number against the College of William & Mary in 2016. Greenberg shot a deadly 13-15 from the field while hitting her first nine shots. Greenberg also had five rebounds and three steals in the contest. For the second week in a row, Greenberg was honored by the CAA, earning Player of the Week for the second time this season. For UNCW, Smith led with 17 points, along with five rebounds and two steals. Drexel went 24-48 (50 percent) from the field, including 7-20 (35 percent) from deep. The Seahawks were held to 21-53 (39.6 percent) from the floor while shooting 3-14 (21.4 percent) from three. This weekend, the Dragons will go back on the road where they are undefeated this season. The team will travel to North Carolina to take on the struggling Elon University Phoenix, who have lost four straight, Feb. 1 at 7 p.m. Then they will square off with the College of William & Mary Tribe in Williamsburg, Virginia, Feb. 3 at 2 p.m.